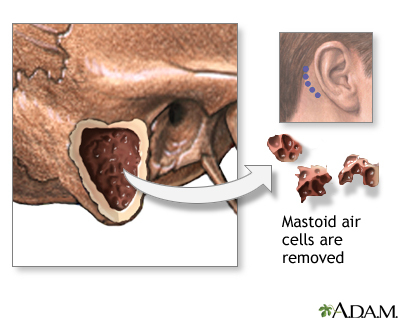 A mastoidectomy is surgery to remove cells in the hollow, air-filled spaces in the skull behind the ear. 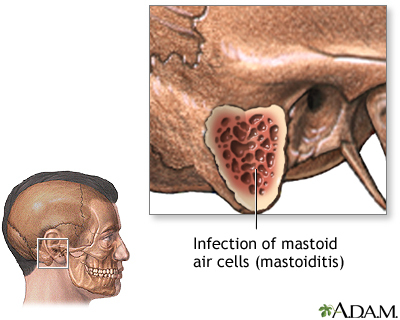 These cells are called mastoid air cells. Chole RA. Chronic otitis media, mastoiditis, and petrositis. In: Flint PW, Haughey BH, Lund V, et al, eds. Cummings Otolaryngology . 6th ed. Philadelphia, PA: Elsevier Saunders; 2015:chap 139. Stevens SM, Lambert PR. 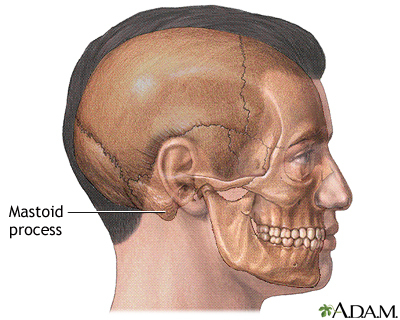 Mastoidectomy. In: Flint PW, Haughey BH, Lund V, et al, eds. Cummings Otolaryngology . 6th ed. Philadelphia, PA: Elsevier Saunders; 2015:chap 142.